I always look forward Spa Week like Christmas. Who does not love a great price for a great relaxing spa session like a massage or facial or mani/pedi and so on?!? With huge events likes this, booking appointments have started since Sept.9. and check out the participating spas and salons near you! Spa Week Media Group, Ltd. is the leading health, beauty and wellness marketing company across North America. Through its website SpaWeek.com, millions of consumers from coast to coast benefit from an abundance of resources necessary to experience a healthier, well-rounded lifestyle, 365 days a year. 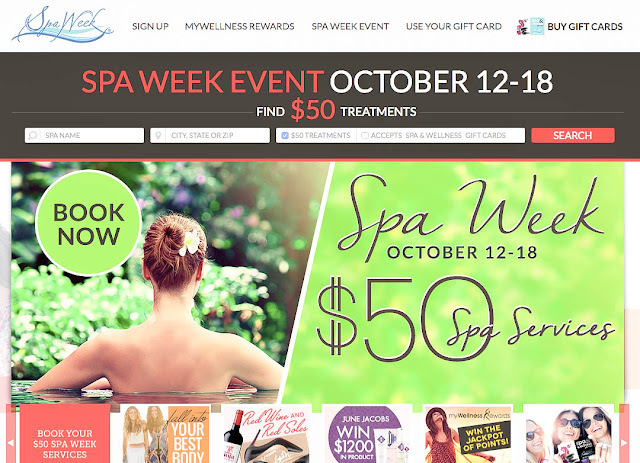 Since its inception in 2004, Spa Week has continued to revolutionize the industry with the success of its biannual Spring and Fall Events with signature $50 spa services, life-changing promotions and a robust gift card program. Spa Week continues its dedication of delivering the best in health and wellness year round with its Spa & Wellness Gift Card, the premier spa gift card of choice by consumers. This gift card is accepted at over 8,000 spa and wellness locations across North America and is sold in over 55,000 retail stores nationwide including Target, CVS, Rite Aid, and Sam's Club and on SpaWeek.com. It’s never been more convenient to give and enjoy the gift of wellness. Luxury treatments at affordable prices are on the menu at hundreds of health and wellness practices nationwide during Spa Week’s Fall 2015 Event (October 12th – 18th). Many signature treatments will be offered at a special rate of $50/treatment (normally $100-$500 treatment) at participating spas (day, medical, and resort), yoga and pilates studios, fitness and nutrition centers. Millions of spa-goers will look to these treatments to enrich their personal health and well-being, rather than just to pamper themselves. From the most modern massage and bodywork techniques, to cutting edge skincare procedures, to classes focusing on fitness, nutrition, and mind/body, there’s something for everyone on the Spa Week menu. Wellness is now a mainstream lifestyle; it is no longer a unique or niche belief. It is a fact that incorporating spa and wellness treatments into your life will improve your health and well-being. This necessary nurturing has proven to reduce anxiety and stress, elevate self-confidence and boost performance levels. Consumers are more health conscious than ever. Finding the time for spa treatments is no longer a luxury but a necessary balance of your everyday life. Spa Week has successfully spread this message for more than a decade and enabled millions to live a healthier lifestyle. Tons of salons and spas participate on Spa Week so if you want to try a new treatment or a new spa location, this is a great way to do that. At a very reasonable price, do book your appointments now since they have been taking appointments since Sept.9! This Biannual event is a great way to treat yourself without breaking the bank.